You may not often think about the value of your company’s or institution’s assets – but you can be sure that potential thieves do. Without reliable theft prevention devices in place, your PCs, laptops, printers and machinery are worth thousands of pounds to criminals. However, once marked with SelectaDNA, they become almost worthless to them – reducing the chances of theft dramatically. 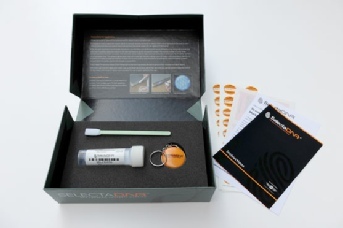 Our small commercial kit allows you to mark at least 100 of your most valuable assets with a solution of unique DNA code and microdots that is only visible under UV light. This combination instantly identifies the property as belonging to your company or institution, making resale on the black market next to impossible. Furthermore it links criminals directly to their crime – so your assets are not nearly as attractive to thieves as they might have been. By displaying the warning signs, posters and stickers included in the kit, thieves will know to keep away. The price of this kit is a one-off cost. You will NOT be committing yourself to recurring annual licence fees. The SelectaDNA small commercial kit is designed for small businesses and SMEs, as well as smaller schools, university departments and local councils. Apply the formula to goods such as Tablets, Desktop PCs, Laptops, Plant Machinery, AV Equipment, Tools Printers etc., attach the tamper-resistant warning stickers and prominently display the window stickers and warning posters to let thieves know what they’re up against and you’re fully protected! Finally, register your marked possessions on our Police and Insurance approved Secure Asset Register so that if the worst happens and your property is stolen, Police from around the world can reunite you with it quickly and easily.